Our good friend Edwin, the xEmonerdx, just posted this on his blog and I wanted everyone to make sure to check it out. 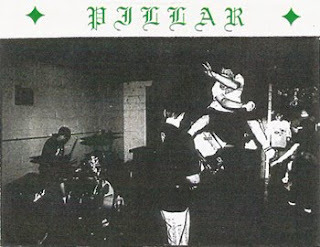 Pillar featured Dave Walker of Harvest and Justin Kane of Disembodied. Im not going to go into loads of info but go to Edwin's blog and download this demo. Click the link below to go directly to the post Edwin made for all the info as well as a link to download the demo. while i appreciate that you uploaded this... this is so amazingly bad that i almost can't believe members went on to good bands, let alone great bands. Poison The Well's van and trailer stolen!! !